Insightful and provocative, The Mountaintop is a moving and magical look back at the life of one of the most inspirational men to walk the Earth – Dr Martin Luther King Jr. But far from putting him on a pedestal, it’s a warts-and-all portrait of a human being, culminating in a blistering recap of decades of civil rights history, right up to the present day. Penned by brilliant young Memphis playwright Katori Hall, The Mountaintop was a West End and Broadway sell-out. When it was produced in London, The Mountaintop received the 2010 Olivier Award for best new play. It also had a four-month run on Broadway with Samuel L. Jackson and Angela Bassett in the roles of Dr. King and Camae. This is a stage experience not to be missed…wearied but resolute after his years-long march at the head of the Civil Rights Movement, Dr Martin Luther King Jr checks into room 306 at the modest Lorraine Motel. Before the sun sets again, he will be shot and killed. Then, King’s late-night room service coffee comes with more of a kick than he bargained for: Camae, a hotel maid on her first night on the job. Fascinated by this beautiful, brassy, and often blunt lady, King allows her to take him on a journey to confront his past and reflect on his deeds before his date with destiny. 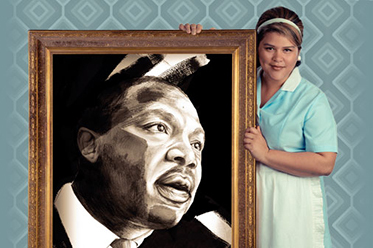 The Mountaintop opens at the Playhouse Theatre under the direction of Todd MacDonald with a two-star cast of Zimbabwe-born, Brisbane-raised Pacharo Mzembe playing Reverend King, while Camae will be played by vivacious actress, activist and hip-hop sensation Candy Bowers. For more information, visit: www.queenslandtheatre.com.au for details.